Discussion in 'Model S: Interior & Exterior' started by EarlyAdopter, Jan 18, 2014. 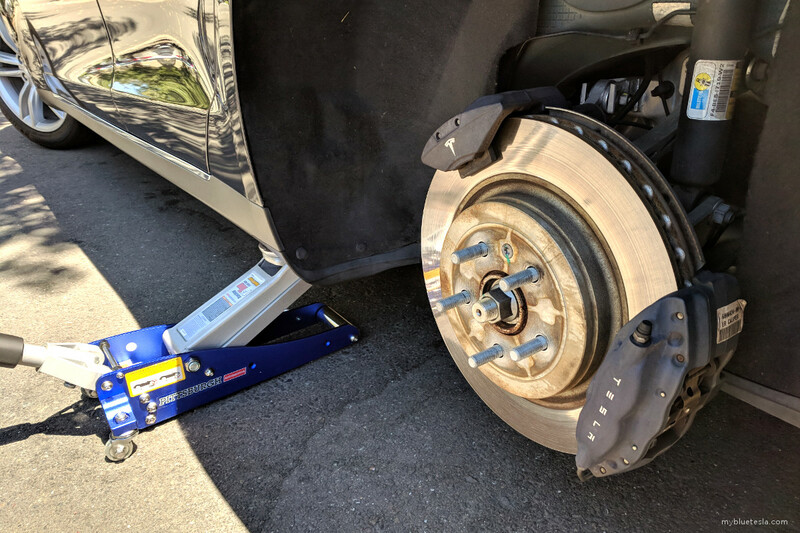 I had my Model S in for tire rotation and some other minor things the other day. I mentioned I had some rust developing on my rotor hats (not the surface of the rotor where the pads grab - that's normal). I think it may have been from a wheel cleaner a detailer used on it, but not sure. I only wash my wheels with car soap and water. It's just an aesthetics thing, but I show my car a lot so want it looking tops. They have a quick and easy remedy now. They hit the rotors with sealant from Wurth called SBS Brake Treatment and they look good as (or better than) new! Thanks Tesla - awesome service. If you're seeing the same thing, just mention it next time you're in for service. Sure they are not new rotors? I don't see the radial scribe marks on the before photos. Awesome result in any event. Quite sure. They mentioned when I called to make the appointment they have a "product they can apply" and the repair invoice lists "coated rotors with SBS treatment." Pretty impressive stuff, isn't it! Exact same thing I was wondering. In the before picture, you can see two ground rings on the hat: one is narrow but deep, and the other is wide and shallow. In the after picture, it's a perfectly flat surface and the deep ring appears to be set further away from the wheel. Probably an illusion, or maybe they had to grind down the hat slightly to remove all the rust? That surface is so smooth it seems unlikely they could have just rubbed some steel wool on it. The result is pretty fantastic. Looks great. Edit: Just read that this stuff is essentially spraying on a layer of aluminum. That would explain why it looks so smooth. I just realized the before and after pictures I posted are different rotors (one's the rear, the other the front - you can tell from the position of the calipers). I just used those two photos as they happened to be at the same angle. I'll take some more pics tonight so you can see the exact same rotor. Yes, the hats look much smoother than before, even when they were new. That's part of why I thought they looked better than new. In the youtube video they spray a thick layer on the entire disc. Why on earth would you do that? The pad contact area is going to be scrubbed clean again in a minute, but maybe the pads will suffer from this? I understand the point of spraying the drum like above here, and the result looks nice. Just wondering if the video is a joke, or if it really is supposed to be used like that...? Interesting. Maybe just for demonstration purposes? All that aluminum will become embedded in your brake pads until it burns/wears off. Probably not great. Considering they're not wearing paint masks, don't mask off any of the rest of the stuff down there in the wheel well, or even cover the car's paint (!!! ), I'm not sure that video is a great example of how to use the product. The Wurth site claims that product is primarily intended for application to the rotor surface to cut down on squeal, so spraying there is actually correct. 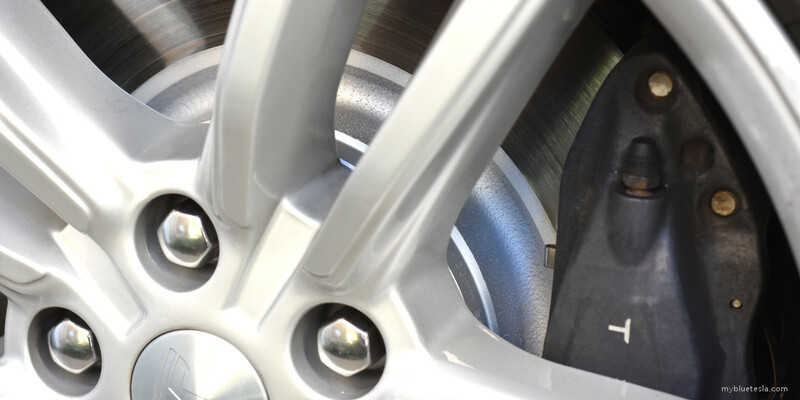 SBS Brake Treatment II is a revolutionary spray-on metalizing treatment designed to prevent brake noise at the source. When applied as directed, microfine aluminum particles form a molecular bond with the rotor/drum friction surfaces. This composite surface finish ends annoying vibrations and brake squeal at the source, giving the assurance of a quality brake job. So how has the SBS spray held up so far? Do you know where I might be able to buy it? The Wurth site will not let me "add to cart". It held up great for the year that I continued to own that P85. I sold it and bought a P85D in December 2014, so only had a year of wear and tear to go on. Problem didn't come back in that time. I didn't buy it - my local Tesla Service Center applied it. You don't see scribe marks and will not because SBS is Micronized Aluminum. It's designed to fill in pock marks, pits and scribes on the rotor face to decrease vibration, squeal and noise. Another benefit as @EarlyAdopter mentioned is it also prevents rust on both the rotor and hat. Good from -100F to +1800F. Looks amazing. Like new rotors and hats. This whole thread is sounding like a plug for a product. It's one of those "gotta see it with my own eyes to believe it" things. I just bought some sliver hi-temp caliper paint for my rusty hats... haven't applied it yet tho. This process is not new and one that I have used for decades. It's called cold galvanizing. Zinc is painted or sprayed on raw steel to prevent rust. Mil Spec versions are available to paint on and a spray is available at Home Depot (Rustoleum brand). It's not as bright as aluminium but it looks clean and does the job. I expect this aluminium spray works the same way. 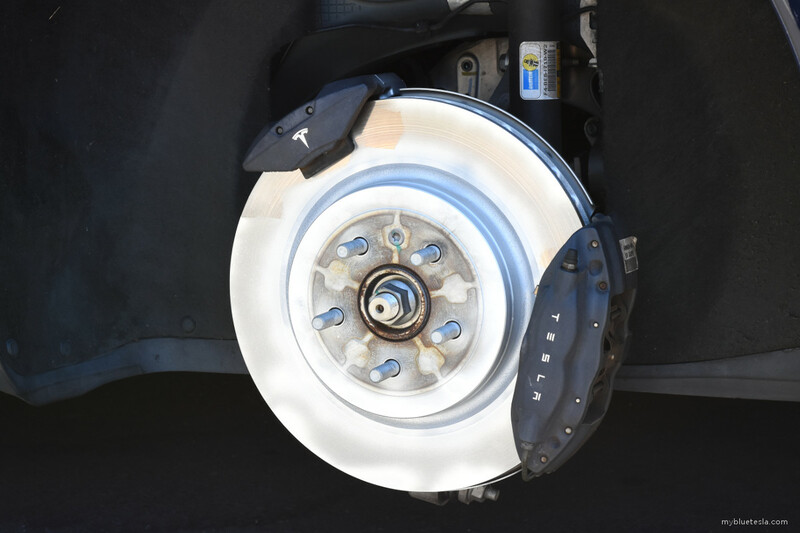 The metal particles do not affect the brake pads and the zinc coating is not affected by high heat. I use the SBS and re-spray it every 6 months when I change wheels winter to summer. Rotars look spotless!! So, do you have to mask off anything once the wheel is off or just go nuts with it? Do you have to remove any rust or just make sure it's clean as prep? No masking is required, in my experience with cold galvanizing spray. I concentrate on the areas to be covered and try to avoid excess on the areas where the pads touch however the pads will scrape off the metal particles in a few rotations. It's easy to get good results with a newer car. When dealing with old rusty rotors on old cars, I clean the surface and coat it entirely with zinc. The pads will clean off the high spots first and eventually the entire rotor. I reapply zinc every few years. The rotors and callipers will have a dull grey colour with zinc but look great compared to most cars..
Is this a normal service all SCs will do? I can't believe I have missed this thread until now. Well I finally got around to cleaning up my hats. Just used a wire brush wheel on my drill to polish the rust off. It looked pretty good as is but I spayed some high temperature caliper paint on after to see if might help prevent the rust from forming this winter. I just did this today. In short, it looks good so far and I'll see how it holds up. Apparently holds up for a long time, if not forever(?) according to posts on this topic.